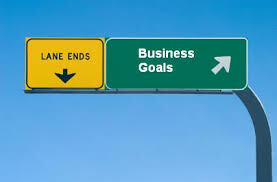 Starting a New Year, every business, well maybe almost everyone, will set goals for the new year. Planning and setting business goals for most is an annual event and sometimes it’s called a budget! However, I want to recommend a different course in setting your key business goals. It maybe that you have a written business plan and are planning on following that. My advice is to start from scratch and look at setting your business 3 key goals. These may take longer than 12 months to achieve but in trying to get there, will prove a huge learning experience. This in itself will help improve your understanding of your business. Here are the 3 key goals, I would recommend every business sets for themselves. 1. Become No 1 or 2 in your business sector – whether your business is in a niche or not, this is a goal that every business should set themselves, even if they are very small. Some of the largest businesses today started small. The key here is not to consider if the goal is unrealistic but to change your mindset and attitude including those of your staff. It will certainly take longer than a year to achieve but the aim is to start the journey and have a target. 2. Increase your EBITDA margin – ensure you know how your EBITDA margins compare to that of your competition. If you’re trailing behind or are average, it means that you’re not No 1 or 2! Look at the leaders in your sector and see what they do differently. My blogs on “Understanding EBITDA – it’s importance in your business” http://bit.ly/YYcsD3 and “How to increase profitability – 10 Key Tips” http://bit.ly/1ljMfJz show how to achieve this. Make sure that any new business or projects you do have a better rate of return than your current margin. 3. Keep measuring your business performance – trying to achieve any goal is impossible if you don’t or can’t measure performance. It is vital to have key performance indicators set up to measure how well your business is performing and how near or far your goals are. You can only set corrective measures if you constantly measure performance. Have these embedded in your monthly accounting reports. My blogs on “3 Critical Key Performance Indicators to use in your Business” http://bit.ly/10JUfrd and “3 Tips on setting up Key Performance Indicators for your Business” http://bit.ly/13XYyjc highlight how and what you need to set up. It may all sound daunting but if you don’t set yourself a challenge, you may find your business going backwards. Standing still is not an option.